In 1934, Architectural Digest published another edition presenting beautiful black-and-white photographs of elegant houses and imposing buildings by prominent southern California architects. This particular issue included works by Gordon B. Kaufmann, designer of buildings such as the Athenaeum at the California Institute of Technology (1930), Denison Library at Scripps College (1930), and the Times Mirror Building in Los Angeles (1931-1935); George Washington Smith, renowned for his Spanish colonial revival style homes in and around Santa Barbara, Bel Air and Pasadena; and Wallace Neff, noted for his Spanish colonial revival houses in Bel Air and the Pasadena area.1 In addition to these well-known architects, the magazine also featured a house designed by Cliff May, who had no architectural training and little building experience. Moreover, the home included in this publication was only the second house May had designed and built. But it would mark the beginning of a long and prolific architectural career for May. When he died in 1989 at the age of eighty-one, he had designed numerous commercial buildings, over one thousand custom homes, and several tract house plans resulting in more than eighteen thousand tract houses.2 But out of all of his work, this southern California native is best known and remembered for developing the suburban dream home of the 1940s and 1950s—the California ranch house. Cliff May’s family background and childhood greatly influenced his work. Born to Beatrice Magee and Charles Clifford May in 1908 in San Diego, May was a sixth-generation Californian through his mother, a descendent of the distinguished Estudillo and de Pedrorena families of San Diego. Both families not only had served in a number of important military, political, economic, and social positions under Spanish, Mexican, and American rule, but also had owned several large ranchos in present-day San Diego and Riverside counties. In addition, they had owned land in Old Town San Diego and it is here that they had built their main residences: Casa de Estudillo and Casa de Pedrorena. Built after 1845, Casa de Pedrorena was one of the first frame houses in Old Town. Casa de Estudillo, on the other hand, was constructed almost twenty years earlier as a one-story, U-shaped adobe house that was common in southern California throughout most of the nineteenth century. By the twentieth century both families’ vast ranchos had disappeared and only their town houses had survived.3 Furthermore, the Estudillo House was restored as a museum in 1910 and publicized as “Ramona’s Marriage Place,” becoming part of the growing movement to preserve the romance of California’s rancho days.4 Thus, as the young May grew up in San Diego he could easily visit the former houses of his California ancestors. May became familiar with two other nineteenth-century ranch houses during his youth, too. His aunt, Jane Magee, operated a lima bean farm on Rancho Santa Margarita y Las Flores in Oceanside. Once belonging to Pío Pico and his brother, Andrés, the rancho included two houses by the time the Magee family leased the property in the 1880s: the Rancho Santa Margarita and Las Flores Adobe. Rancho Santa Margarita, built in succession over time in the nineteenth century, is a traditional U-shaped adobe house while the Las Flores Adobe, built after 1865, is in the Monterey style. It was on this farm that May spent many summers with his aunt living in the Las Flores Adobe and next to the Rancho Santa Margarita.5 As seen in May’s writings and designs, these two ranch houses in addition to the Estudillo House would profoundly shape his ideas on the ranch house of the twentieth century. 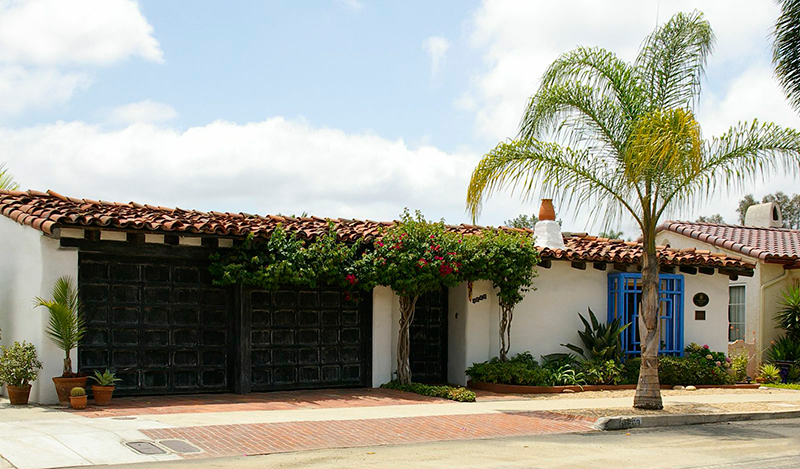 By 1937 May had constructed over fifty houses and several non-residential buildings in the San Diego area.16 His early houses were very much based on the nineteenth-century ranch houses he had come to know in his childhood. Generally, May designed his houses as asymmetrical, one-story dwellings with a low-pitched roof and wide overhanging eaves. One room deep, it was crucial that the house take an L- or U-shaped configuration to form a patio or courtyard in the back so that the rooms of the ranch house faced or opened into these areas. Like the California adobes of the nineteenth century, May’s houses did not include an interior hallway. Instead an exterior corredor or covered veranda served as the primary hallway of the house. May also designed his houses so that they presented a blank façade to the street, however, he modernized his ranch houses with the use of large picture windows for the rooms facing the back. May built his houses in two styles. His “Mexican Haciendas” were in the Spanish colonial revival style and featured red tile roofs, coarsely plastered walls, and deeply inset windows and doors with rough-hewn wooden lintels and shutters. 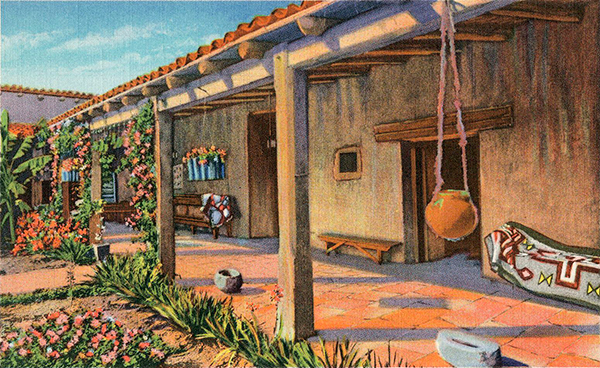 By deliberately creating a crude, handcrafted appearance on the exterior of his haciendas, May’s houses are very similar in look and feel to nineteenth-century California adobes such as the Estudillo House in San Diego. In contrast, his “Early California Rancherias” resembled the vernacular architecture of the West in the nineteenth century with their wood-shingle roofs and board-and-batten walls.17 Clearly, both styles worked well for May and he continued to elaborate on them after he moved to Los Angeles during this period. 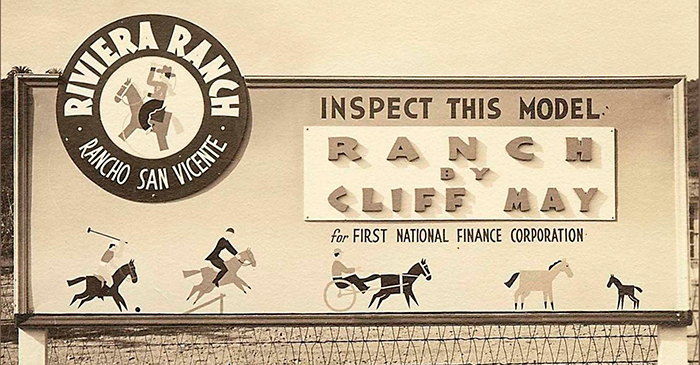 As the Magic-Money House grew in popularity so did Cliff May and the ranch house. In 1955, more than eight out of ten tract houses built in the United States were in the ranch style and Cliff May was the leading designer.46 Not only could May point to the number of ranch houses and non-residential buildings he designed and built but also the professional appointments he served and awards received. From 1940-1950 May was president of the Los Angeles division of the Building Contractors Association and from 1946-1952 a staff consultant to House Beautiful magazine. In 1947, 1952, and 1953 May won design awards from the National Association of Home Builders. Later he received an Award of Merit for Residential Design and Construction from House and Home in 1956 and the “Hallmark House” award from House and Garden in 1958.47 But, by far, May’s greatest success occurred when Sunset magazine produced a second Western ranch house book that featured his work exclusively—an accomplishment few architects have achieved. Western Ranch Houses by Cliff May presents a broad sampling of May’s postwar work as well as the evolution of his Modernist ideas towards housing. The most important and creative of these are the ranch houses he designed for his family. In 1949 May remodeled his Riviera Ranch House in West Los Angeles expanding on the indoor-outdoor living concept by replacing fixed windows with sliding glass doors and enlarging the patio area in the backyard.48 However, May went even further with “bringing the outdoors in” as well as the idea of open planning when he built an “Experimental House” for his family in the early 1950s. A bold design, May created this house as a one-story, rectangular plan with a 288-square-foot open skylight down the center of the roof, glass walls, and only three interior walls for two bathrooms and a kitchen. Consisting of approximately 1,800 square feet of living space, May’s family of five formed different rooms through the use of movable partitions. The family lived in the house for two years while May learned how his open plan and sizeable skylight worked for the family.49 From their experiences May designed and built “Mandalay,” his last home for his family. Mandalay integrated the design of the Experimental House with May’s latest thinking on the ranch style and Modernist ideas. Built in Sullivan Canyon in West Los Angeles in 1956, May designed Mandalay as a one-story dwelling with wings projecting at right angles from a central spine.50 He covered the low-pitched roofs with pebbles from a California creek bed and in two sections he cut skylights extending from one end of the roof to the other. He also extensively utilized glass walls, sliding glass windows, and indoor/outdoor planters—all design elements used in the Experimental House. More importantly, May added a new concept to the idea of bringing the outdoors in. Not only did he use the same paving materials inside and out but also the same ceiling and wall materials. Wooden roof beams and rafters as well as board-and-batten and white-plastered walls flowed from the outdoors in. Moreover, May included radiant heating in the patio terraces and outdoor lighting; ideas that he used in his other homes to make the outdoors feel as part of the indoors at night. In arranging the rooms of the house May combined open planning with private spaces for the family. A large house, consisting of 6,300 square feet, May designed the entry, kitchen, and living, dining, and family rooms as one open area with no intervening doors. However, in creating spaces for the bedrooms, dressing rooms, and bathrooms, May did not make use of partitions as he had in the Experimental House. Instead, he built interior walls and doors to provide privacy for these rooms. What is most interesting about Mandalay was May’s ideas about the ranch style. 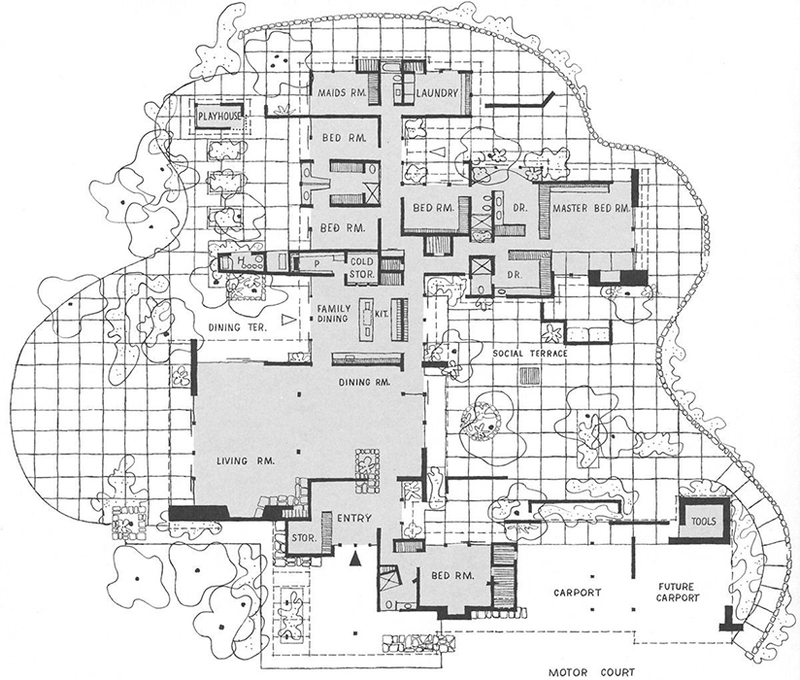 Although May designed the house as an asymmetrical, one-story dwelling, the plan was complex, forming courtyards on both sides of the house rather than having the main courtyard in the center. The roof was low-pitched with wide overhanging eaves but covered with rock rather than wood shingles. May included board-and-batten as well as white-plastered walls but felt that he needed to give the house “a sophisticated touch of the [Spanish] past.” To achieve such a worldly look, he added Spanish, Mexican, and French architectural crafts and decorative elements: a sixteenth-century Gothic grille, historic doors, lighting fixtures, and wrought-iron door handles, and antiquated books.51 Indeed, May’s California ranch house of the 1950s resembled a Contemporary Modern house rather than a nineteenth-century California adobe that he once strove to emulate in the 1930s. Throughout the rest of his life, Cliff May would continue to design award-winning houses and non-residential buildings, including the famous Robert Mondavi Winery building that has appeared on Mondavi wine bottle labels since the 1960s.52 Yet, May was more than a designer of ranch houses and commercial buildings. He was an innovator, too. During his career he developed new flooring, heating, cooling, lighting, and wall systems. He also experimented with modular and prefabricated construction after World War II.53 And he continued to design and build furniture.54 But because May did not become a licensed architect until 1988, a year before he died, he never received recognition for his designs nor innovations by the profession’s association, the American Institute of Architects.55 In addition, although scholars recognized May’s contribution for developing the California ranch house, the style itself was generally considered a vernacular rather than an exceptional or significant architectural style, and thus, not truly worthy of a lengthy study. However, this is beginning to change. The California ranch house has reached its fiftieth anniversary, prompting a growing fascination in this “new” historic architectural style and Cliff May. Indeed, local historical groups have begun to arrange lectures about May and organize tours to view his works. Hennessey & Ingalls, a company that specializes in republishing “classic” architectural books, lately reprinted Sunset Western Ranch Houses and Western Ranch Houses by Cliff May making them available again to the general public. Moreover, two of May’s houses—the Lindstrom House and Experimental House—were recently listed as historic landmarks.56 Most of all, historians are now seriously researching the ranch style and interpreting it as the significant architectural style of the 1940s and 1950s. 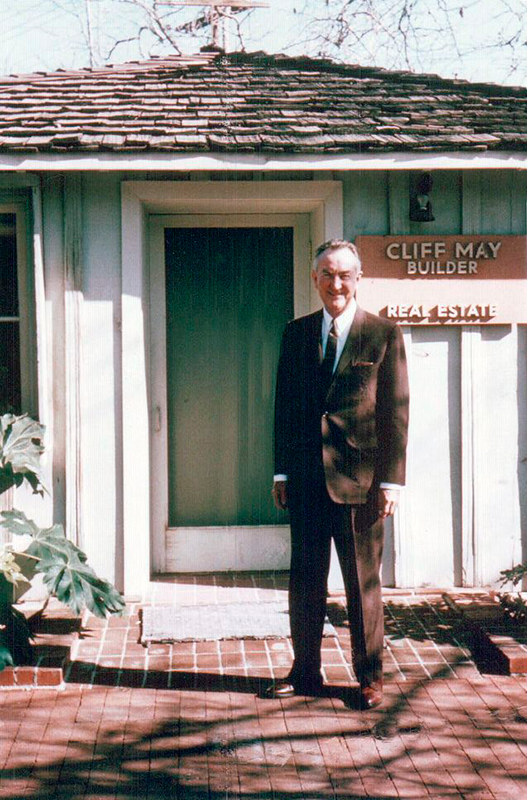 As a result, they are recognizing Cliff May for not only defining the California ranch house but also as the major designer of the American dream home of the 1940s and 1950s—a style that is still built extensively today. This article was originally published in the Southern California Quarterly 86, no. 2 (2004). No part of this publication may be reproduced, stored in a retrieval system, or transmitted in any form or by any means, electronic, mechanical, photocopying, recording, or otherwise, without written permission of the author. Mary A. van Balgooy is an award-winning museum professional who has worked in a variety of institutions, including archives, botanic gardens, historic houses, historical societies, museums, preservation organizations, universities, and governmental agencies at city, county, and federal levels with major responsibilities for administration, collections, education and interpretation, fundraising, preservation, and public relations. 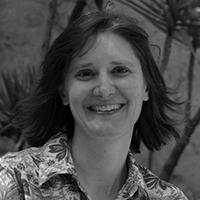 Mary is vice president of Engaging Places, LLC, and the first executive director of the Society of Woman Geographers (SWG), an international membership association based in Washington, D.C.
1 Architectural Digest IX . For more information on these architects and their designs see David Gebhard and Robert Winter, Architecture in Los Angeles: A Compleat Guide (Salt Lake City: Peregrine Smith Books, 1985), 18, 122, 232, 339, 375, 415. 2 May’s career spanned almost sixty years. Sam Hall Kaplan, “Cliff May: Designer of Dream Houses,” Los Angeles Times, 29 October 1989, sec. K; Brendan Gill, “Remembering Cliff May,” Architectural Digest 48 (May 1991): 30. 3 David Bricker, “Cliff May” in Toward a Simpler Way of Life: The Arts & Crafts Architects of California, ed. Robert Winter (Berkeley and Los Angeles: University of California Press, 1997), 283; R. W. Brackett, A History of the Ranchos of San Diego County, California (San Diego: Union Title Insurance and Trust Company, 1939), 22-25, 64-66; “Casa de Estudillo,” 1999-2001 <http://www.sandiegohistory.org/links/oldtown.htm#estudillo> (30 December 2001); Sally B. Woodbridge, California Architecture: Historic American Buildings Survey (San Francisco: Chronicle Books, 1988), 202-203. 4 Sally Bullard Thornton, “Hazel Wood Waterman” in Winter, ed., Toward a Simpler Way of Life, 221-223. 5 Kathie Graler, “Spanish Missions and Adobe” in Settler Communities in the West, July 1994, <https://www.denix.osd.mil/denix/Public/ES-Programs/Conservation/Legacy/Settler/sett6.html> (22 Jan. 2002); Cliff May, interview by Marlene L. Laskey, 1984, Oral History Program, University of California, Los Angeles, viii. 6 Bricker, “Cliff May,” 284. In his oral history, May stated he took all upper division business courses when he first enrolled. After completing those courses he did not want to take the basic requirement classes for his degree because he was impatient to get out into the world. May interview by Laskey, viii, 79. 8 Roger Renick, “Monterey Furniture: California Spanish Revival, 1929-1943,” West Coast Peddler 31 (March 1999): 51-57; Robert L. Smith, et al., Monterey: California Rancho Furniture, Pottery and Art (exhibit catalogue) (Santa Monica: Santa Monica Heritage Museum, 1989). 9 May married Jean Lichty in 1932 at the San Diego Mission. Lecture presented by Jody Greenwald, Mount St. Mary’s College, California, 23 September 2000. 10 May interview by Laskey, 81-83. The history of who May worked with to install his furniture in model homes as well as construct his first house is unclear. In his oral history May states that he placed his furniture in the house of a friend O. U. Miracle, who was a realtor. It was Miracle who then introduced him to his future father-in-law, R. C. Lichty. However, David Bricker writes that May placed his furniture in one of Lichty’s model homes and that May worked in partnership with Miracle, who was Lichty’s grading contactor to design and build the O’Leary house. Bricker, “Cliff May,” 285. 11 At this time, one could practice architecture if one notified the client in writing that one was not an architect. In his oral history May commented that he drew up simple floor plans that would not pass inspection today. In addition, his friend and “mentor,” William F. Hale, taught him how to construct this house. The building of the house started in 1931. May interview by Laskey, 85, 90-91, 93. 12 Ibid., 83; David Bricker, “Built for Sale: Cliff May and the Low Cost California Ranch House” (Master’s Thesis, University of California, Santa Barbara, 1983), 111, n. 28. 13 “Cliff May, Miracle Company” advertisement in Architectural Digest IX : 84. 14 Bricker, “Built for Sale,” 111, n. 28. 15 “Haciendas & Rancherias By Cliff May, Honors by the World” advertisement in Architectural Digest IX : 160. 16 May’s non-residential works included a women’s club building and two motels. May interview by Laskey, viii; Bricker, “Built for Sale,” 111, n. 28; 115, n. 35. 17 Many people today associate board-and-batten siding with the frontier West. However, board-and-batten became popular during the picturesque movement with the Gothic revival style (1840-1875) and spread to the West as Americans settled on the frontier. William H. Pierson, Jr., Technology and the Picturesque, the Corporate and the Early Gothic Styles, vol. 2 of American Buildings and Their Architects (New York: Oxford University Press, 1978), 304, 454. 18 John A. Smith was an oil industrialist and banker. He hired May to build a home for him in La Habra after visiting one of May’s completed projects in Presidio Hills, San Diego. Bricker, “Built for Sale,” 112, n. 29. 19 May also built houses in other areas (one in Bel Air and one in Mandeville Canyon) when he first arrived in Los Angeles. Ibid., 12, 112, n. 29; Gill, “Remembering Cliff May,” 30. 20 The development was located on Sunset Boulevard across from the Riviera Country Club Polo Fields. “Open for Inspection, Urban Model Ranch” advertisement in the Los Angeles Times, Sunday, 20 October 1940, sec. 5. 21 Ibid. ; Cynthia Castle, “The Times Home Hunter,” Los Angeles Times, Sunday, 17 November 1940, sec. 5. 22 This was not May’s first house in Los Angeles. When May moved to Los Angeles, he constructed a house in Mandeville Canyon. Soon after the completion of the Riviera Ranch house, May sold his house and moved to the tract development. “Residence of Mr. and Mrs.
Cliff May, Mandeville Canyon,” Architectural Digest X : 52-53. 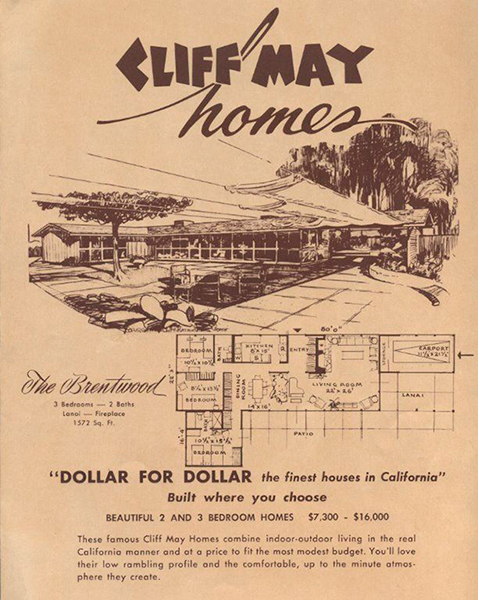 Magazines that featured May’s Riviera Ranch house: “Modern Ranch House of Mr. and Mrs. Cliff May, Riviera Ranch, West Los Angeles 24,” Architectural Digest XI : 4-9; “House in West Los Angeles, California,” Architectural Forum (December 1944): 134-135; Helen Weigel Brown, “Meet a Family That Really Knows How to Live,” House Beautiful (April 1946): 74-99; “Streamlining the Ranch House,” House and Garden (November 1941): 20-21; “What’s the Future of the Ranch House?,” Sunset (June 1944): 10-13; and “More About the Ranch House,” Sunset (June 1944): 38-40. Sunset’s two books are: The Editorial Staff of Sunset Magazine in collaboration with Cliff May, Sunset Western Ranch Houses (1946; reprint, Santa Monica, CA: Hennessey and Ingalls, 1999) and The Editorial Staff of Sunset Magazine and Books under the Direction of Paul C. Johnson, editor of Sunset Books, Western Ranch Houses by Cliff May (1958; reprint, Santa Monica, CA: Hennessey and Ingalls, 1997). 23 Western Ranch Houses by Cliff May, 25. May would remodel Riviera Ranch in 1949. 24 “50 Low Cost Houses,” Architectural Forum 70 (April 1939): 263. 25 “50 Low Cost Houses—House in San Diego, California, Cliff May, Designer,” Architectural Forum 70 (April 1939): 276; “The Low Cost House,” Architectural Forum 70 (April 1939): 261. 26 May’s commissions included temporary barracks in Glendale, a one bedroom duplex development project for Ontario, and single-family defense houses in Wilmington. Bricker, “Built for Sale,” 14-15. 27 Kenneth Jackson, Crabgrass Frontier: The Suburbanization of the United States (New York: Oxford University Press, 1985), 232. 28 Other magazines that featured May include Good Housekeeping, Architectural Record, Pic, Better Homes and Gardens, House and Home, Life, and American Home. 29 Cissie Dore Hill, “Sunset: A Century of Western Living, 1898-1998,” California History 78 (Summer 1999): 95-96; Tomas Jaehn, “Four Eras: Changes of Ownership,” Sunset Magazine: A Century of Western Living, 1898-1998: Historical Portraits and A Chronological Bibliography of Selected Topics (Stanford: Stanford Libraries, 1998), 90, 100. 30 “What is the Western Ranch House,” Sunset (February 1944): 12-13; “Is Ranch House the Name for It?,” Sunset (May 1944): 10-13; “What’s the Future of the Ranch House?,” Sunset (June 1944): 10-13; “More About the Ranch House,” Sunset (June 1944): 38-40; “The Changeable, Flexible Ranch House,” Sunset (July 1944): 10-13. 31 The second architect to have the most designs published was Worley Wong with four. Sunset Western Ranch Houses, 30-160. 32 “The Ranch House, Early California to Today,” Sunset (August 1988): 144. 33 “Sunset Magazine Has a New Home in the Country,” Sunset (August 1951): 29; “On the Next Pages . . . We Invite You on a Walk Through Sunset’s New Home,” Sunset (August 1952): 47-54. 34 The second book on ranch houses was titled Western Ranch Houses by Cliff May. 35 Brown, “Meet a Family,” 74-99. 36 “A House to Set the Pace,” House Beautiful (February 1948): 61-71; “The Advantages of Turning Your Back on the World,” House Beautiful (February 1948): 88-89; “A Four-Way Kitchen,” House Beautiful (February 1948): 106-107; “Advanced,” House Beautiful (February 1948): 110-111. The Pace-Setter House was then sold. It still stands today in Los Angeles and is a private residence. 37 Western Ranch Houses by Cliff May, 66. 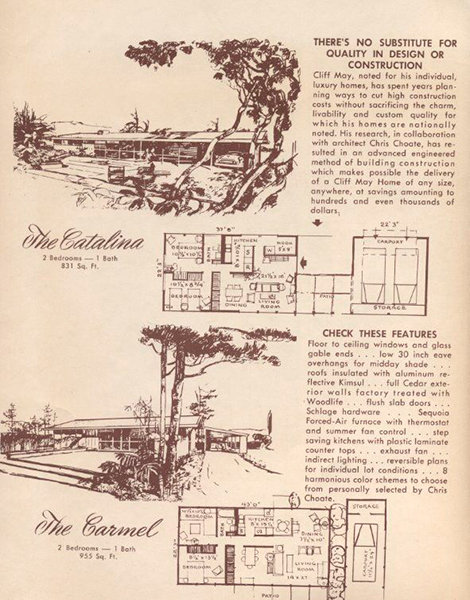 38 From 1945 to 1947 magazines referred to California domestic architecture four times more than any other state. Thomas Hine, “The Search for the Postwar House” in Blueprints for Modern Living: History and Legacy of the Case Study Houses, ed. Elizabeth A. T. Smith (Los Angeles: The Museum of Contemporary Art, 1989), 172. 39 Ibid. ; Anne Edwards, “Gregory Peck: To Kill a Mockingbird’s Oscar Winner in Pacific Palisades,” Architectural Digest 53 (April 1996): 166-171, 296. 40 Clifford Edward Clark, Jr., The American Family Home, 1800-1960 (Chapel Hill: The University of North Carolina Press, 1986), 210-211; Gwendolyn Wright, Building the Dream: A Social History of Housing in America (Cambridge: The MIT Press, 1981), 242, 253. 41 Lesley Jackson, ed., ‘Contemporary’: Architecture and Interiors of the 1950s (London: Phaidon Press Ltd., 1994), 19, 23-25. 42 Sunset magazine featured the house for their cover article. “More Living Space,” Sunset (November 1952): 44-47. 43 Chris Choate started working for May after World War II. He became May’s associate architect in 1949 and their business relationship lasted until the mid-1950s. Bricker, “Built for Sale,” 14, 82, 85. 44 “Look What’s on Sloane’s Roof!” advertisement in the Los Angeles Times, Sunday, 21 June 1953, sec. 5. The store was located at 9560 Wilshire Boulevard, Beverly Hills. 45 Bricker, “Built for Sale,” 87-88, 91. 46 Ibid., 81. The design and look of the ranch house in other parts of the country did vary according to climate and tastes. 47 May interview by Laskey, ix. 48 Western Ranch Houses by Cliff May, 24-39. 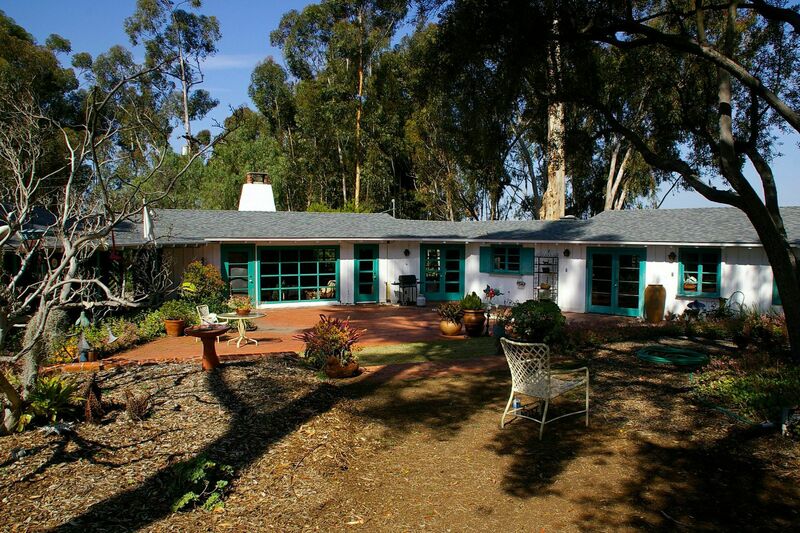 50 In Western Ranch Houses by Cliff May, Sunset states that the house was built in 1956. However, other sources including photographs by Julius Shulman indicate that Mandalay was completed by 1953. Ibid., 142; Lecture by Jody Greenwald, 23 September 2000. 51 Western Ranch Houses by Cliff May, 142-159. May lived in Mandalay until his death in the 1980s. During the time that he lived there, he remodeled the house thirteen times. In 1994 the house was demolished. Lecture by Jody Greenwald, 23 September 2000; Annette Andreozzi, “Cliff May’s Definitive Ranch House Demolished,” Los Angeles Conservancy News 17 (May/June 1995): 4. 52 David Colen, “View from Wappo Hill,” Architectural Digest 46 (May 1989): 276-282. 53 May interview by Laskey, xi. 54 Laura Tanner, “Outdoor Furniture That Can Stay Out,” House Beautiful (May 1950): 160-166. 55 Kaplan, “Cliff May,” sec. K. When May moved to Los Angeles he built a house in Bel Air that received a lot of publicity. Apparently some local members of the A. I. A. did not like all the attention May was attracting nor the liberal use of the title “architect” attached to his name since he was not licensed as one. Thus, they threatened May with a lawsuit. Fortunately, May’s friend John Smith stepped in and had his attorneys clear any grievance against him. However, May would not be allowed to use the title “architect,” only designer or builder. Bricker, “Built for Sale,” 12, 113, n. 30; Gill, “Remembering Cliff May,” 30. 56 The Lindstrom House was listed on the National Register of Historic Places on 13 February 2001 and the City of Los Angeles Cultural Commission designated May’s Experimental House as a Historic-Cultural Monument in May 2002.